Also renza 蓮座. Lit. Lotus base (Sk: padmasana). A dais for a Buddhist image *daiza 台座 which is modeled after the lotus flower renge 蓮華, an important Buddhist symbol. A lotus rises from the mud and blooms immaculately, and this represents the purity of the Buddha in a defiled world. 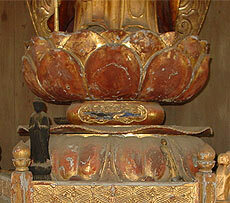 Throughout Asia the lotus base is one of the most common pedestals for a Buddha and bodhisattva *bosatsu 菩薩 image. Early examples are found in Gandhara for images of *Shaka 釈迦 . A lotus base that is a fully-opened flower is referred to as kaifu renge 開敷蓮華 (also read kaishiki renge). Mikaifu renge 未開敷蓮華 is an unopened lotus, mibu renge 未敷蓮華 is a lotus bud and shokatsu renge 初割蓮華 is a slightly-opened lotus bud. These terms are more often applied to lotuses used as the hand-held attributes *jimotsu 持物 of bodhisattva images, especially *Kannon 観音. In its simplest form, the lotus base consists mainly of the *kaeribana 反花, which is a row of lotus petals turned downward. This was used for the 7c Kudara Kannonzou 百済観音像 at Houryuuji 法隆寺 in Nara . The so-called *daibutsuza 大仏座 base supporting the Great Buddha *daibutsu 大仏, is also in a simple form but has a kaeribana and a row of up-turned lotus petals called gyouren 仰蓮. The simplified forms of the lotus base were often used in Asuka and Hakuhou periods sculptures. An unusual, early representation of a lotus-petal base is found in the 8c bronze Amida Sanzonzou 阿弥陀三尊像 from the Tachibana miniature shrine, Tachibana fujin zushi 橘婦人厨子 kept in the Houryuuji Treasure House. Each figure stands on a lotus with a twisting stem that rises out of a pond depicted in low relief. A more complex, multi-level rengeza is believed to have been created by Jouchou 定朝 ( ?-1057; see *Jouchouyou 定朝様) in the 11c. It consisted of the following sections with some variations: *renniku 蓮肉 (the lotus center); *renben 蓮弁 (the lotus petals); a bulging sphere called uwa shikinasu 上敷茄子; *keban 華盤 (the flower platter); ukeza 受座 (a supporting pedestal that may be round, hexagonal or octogonal); another sphere refered to to as shita shikinasu 下敷茄子 (lower shikinasu, see *shikinasu 敷茄子); and two *kamachiza 框座 (platform frames). 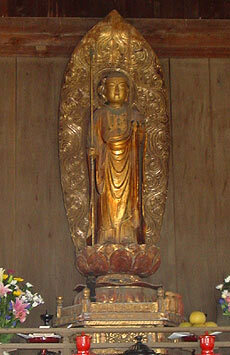 The Amida Nyoraizou 阿弥陀如来像 at Byoudouin *Hououdou 平等院鳳凰堂 (1053) is an example of an image with a complex lotus-pedestal but it only has one shikinasu. In very elaborate examples there may be additional components such as *kesoku 華足, decorative legs or supports that are positioned between the keban and the ukeza. The Senju Kannonzou 千手観音像 (1154) at Bujouji 峰定寺 in Kyoto, has this type of base. Another variation of the lotus pedestal is the fumiwari rengeza 踏割蓮華座 (also called fumiwake rengeza 踏分蓮華座; lotus base with separate feet) in which there are separate lotus pedestals for each foot. Early examples include the celestial musicians depicted on the bronze octagonal lantern (8c) placed in front of the Daibutsuden 大仏殿 at Toudaiji 東大寺 and the 9c *Godai Myouou 五大明王 at Touji Koudou 東寺講堂. This style of base was most popular in the Kamakura period, especially with Pure Land raigou imagery (see *raigou-zu 来迎図), such as the Jizou Bosatsuzou 地蔵菩薩像 at Choumeiji 長命寺, Shiga prefecture, made by Eikai 栄快 in 1254. In many of the Kamakura period double-lotus format bases, the sides of the lotuses are joined together.